A highlight of a fun-filled week of vacation in New Mexico came when I wasn’t expecting it. I got to meet someone who could be called a legend of his sport. The legend in this case is Al Unser, who has won the Indianapolis 500 four different times. That ties the record set by A.J. Foyt and Rick Mears. As the saying goes, Unser isn’t in a class by himself, but it doesn’t take long to call the roll. Then add brother Bobby and son Al Jr. , and you have the first family of Indycar racing. The main branch of the family is from Albuquerque, and the members have accumulated all sorts of stuff over the years. Heck, Bobby won three Indy trophies and Al Jr. won two more. That doesn’t include wins in many other events over the years – more than 200 by everyone . So it’s nice to have some place to show it all off, rather than keep it hidden in boxes or closets. Therefore, the Unser Racing Museum is a must stop for auto racing fans when visiting New Mexico’s largest city. The main building features an outside entryway formed by part of the wall from the Indianapolis Motor Speedway from a while back. Once inside, visitors are greeted by the main display – the winning car from the 1987 Indy 500, nicely shined. It was Al’s fourth win, and it came only a few days before his 48th birthday. The rest of building consists of a few rooms that come off the center display like spokes in a wheel. One is a tribute to the Pikes Peak race, one dominated by the Unser name over the years. I think Bobby won nine of them. There’s a room for Indianapolis, an area of old cars that’s something of a tribute to Al and Bobby’s dad, and a spot for technical details and kids’ activities. Children of all ages can ride in a computer simulation of what it’s like to drive at Indy. I went for a five-lap ride in it, secure in the knowledge that I only had to hit the accelerator and steer the car. In other words, no shifting. Those straightaways end pretty quickly when the speedometer reads 180 mph. After completing the circle of room, a gift shop will let you stock up on all things Unser. In the back, there is another area that holds even more cars – some of which have nothing to do with the Unsers. The day we went, we saw race cars belonging to Dale Earnhardt Jr. and Tony Stewart, as well as a couple of classic vehicles. There are a variety of videos and kiosks throughout both buildings. You really could spend a few hours there in order to see and read everything. It’s very nicely done. But the highlight of our visit was having the chance to meet Al. One member of the museum staff knew he was around the building, and asked if my wife and I would like to meet him. Of course we would. 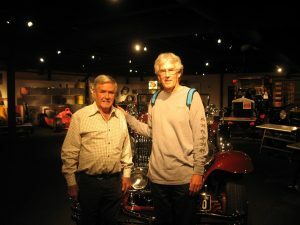 A call went out, and Al came into the museum in a couple of minutes for a little small talk and a photo by a 1931 Duesenberg, which is worth millions. I would guess he has an office in the building. Al seemed very comfortable with interacting with the public. After all, how tough is it to listen to people say how much they enjoyed your career? By the way, Al Jr. is still in Albuquerque; we apparently just missed him while we were visiting. Bobby also lives in the area. He has some severe back problems and doesn’t appear in public much. There are a couple of family trees on the walls of the museum, in case you need to sort out how the various generations of the Unser family line up. Admission is $10 – a bargain price for the chance to meet an all-time great.